Bold beautiful bracelets! I own some of the CARA accessories and love them because you can dress them up or wear them more casual. I am really liking the look of all of these really piled on. The flower cuff with a silver-tone is by TARNISH; the nine-row mini beaded bracelet with white/grey and pearl/silver-tone is by NORDSTROM; the leather braided-chain snap bracelet is by CARA along with the rest of the bracelets here. This shoe is adorable – I love the style!!! They are by Trouve – the ‘Neda’ woven caged sandal in brown leather. You can never go wrong with Sam Edelman! 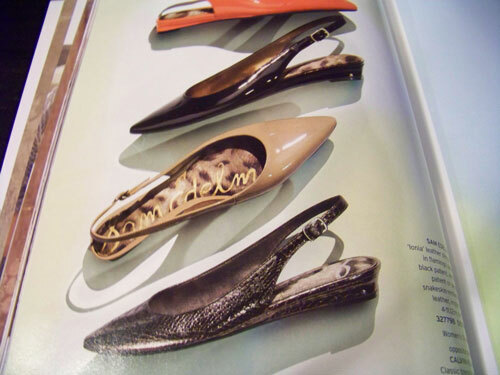 This is a new ‘RETRO-FEMME‘ slingback that is perfect for work or a day and/or night out on the town! Check out all of the great colors they come in, too! My favorite’s are the red and black! I picked this dress out because I love the green!! A JULIE DILLON draped dress in hammered silk in ‘kelp’; add the belt for another great touch! What are some of your favorites??! ?